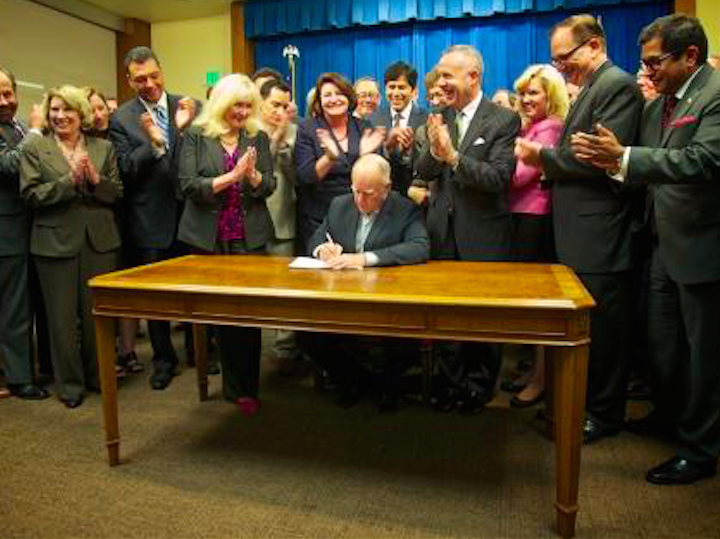 If you are an employer in the private sector in California, you can thank California Governor Jerry Brown. On Wednesday, he signed AB 1522, the bill authored by Assemblywoman Lorena Gonzalez (D-San Diego) that guarantees three paid sick days for all workers in the state. We become the first state in the nation to guarantee paid sick days for every single private-sector worker in the state–no matter what industry they work in, no matter if they are part-time or seasonal, and regardless of the size of their employer. This means more than 6.5 million more workers in this state will be able to take up to three days off when they or their child is sick without fearing the loss of income, hours or their job. AB 1522 will be implemented next July 1 and will require employers to give paid sick leave to employees who work 30 or more days in the first year after they start their job. Each 30-hour total an employee aggregates will earn a minimum of one hour of paid sick leave. Two distinct groups oppose the measure: union leaders, who see it locking out health-care aides who work for California’s In-Home Supportive Services program with disabled or elderly residents; and Republicans and business groups, who are concerned about the added expense for employers. San Diego already has a law hiking the minimum wage that also includes five paid sick days for employees.